Directed by Dr. John Bell, the Wind Symphony at SIUE has had a long history of excellence and is one of two large wind ensembles in the wind studies program at the University. 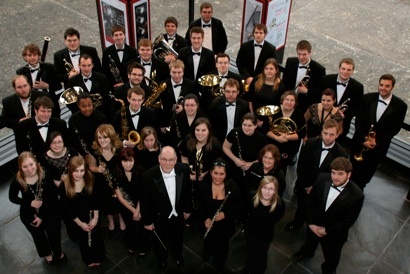 The personnel are composed primarily of undergraduate music performance and music education majors. The mission of the Wind Symphony at SIUE is to study and perform the finest in the core repertoire for wind band, as well as the best of contemporary literature, while educating undergraduate music majors in a positive atmosphere that promotes excellence in performance. The Wind Symphony has premiered 14 works for wind band, toured the United States and Europe, performed twice in New York City’s famed Carnegie Hall and for state, regional, national and international conferences. Guest conductors appearing with the Wind Symphony include Myron Welch, James Keene, Thomas Lee, Eugene Migliaro Corporon, Thomas Leslie, Lowell Graham, James Croft, Tim Lautzenhauser and Victor Markovich. Composers presenting residencies include David Maslanka, Kimberly Archer, David Gillingham and Michael Schelle. The Wind Symphony has been featured on KWTU public radio’s program Wind and Rhythm and has mounted seven compact disc recording projects. Their latest, Wind Adventures, includes a premiere recording of Kimberly Archer’s Concerto for Piano and Wind Ensemble. This album appeared on the Grammy list for consideration for Best Classical Album. All recordings are available on the Mark Masters label. Prospective majors who wish to make a string, woodwind or brass instrument the principal area of applied music must audition for the Department of Music. Note: All prospective students will be asked to sight read at the audition.